Gothic sculpture at its finest. The term "Gothic style" refers to the style of European architecture, sculpture (and minor arts) which linked medieval Romanesque art with the Early Renaissance. The period is divided into Early Gothic (1150-1250), High Gothic (1250-1375), and International Gothic (1375-1450). Primarily a public form of Christian art, it flourished initially in the Ile de France and surrounding region in the period 1150-1250, and then spread throughout northern Europe. 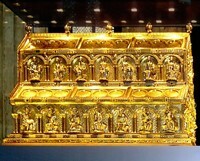 Gothic art, being exclusively religious art, lent powerful tangible weight to the growing power of the Church in Rome. This not only inspired the public, as well as its secular leaders but also it firmly established the connection between religion and art, which was one of the foundations of the Italian Renaissance (1400-1530). Among famous medieval artists in the Gothic style were Giovanni Pisano and Simone Martini of the Sienese School of painting. As in the Romanesque period, the best Gothic sculptors were employed on architectural decoration. The most important examples of stone sculpture to survive are on portals, as in the church of Saint-Denis whose western portals (constructed 1137-40), combined features that remained common throughout the Gothic period: a carved tympanum; carved figures arranged in the voussoirs, or wedge-shaped pieces, of the arch; and more figurative carvings attached to the sides of the portal. As it survives, Saint-Denis is rather disappointing; the side figures have been lost and the remainder heavily restored. The general effect is now better appreciated on the west front of Chartres cathedral, whose portals illustrate the development of the Gothic style. If one compares the portals at Chartres (c.1140-50) with those of 13th-century Reims, one can see that the development of sculpture during this early period of Gothic art is toward increased realism, and away from the rather wooden feel of Romanesque sculpture. As it was, this was achieved not by continuous evolution, but in a series of stylistic impulses. 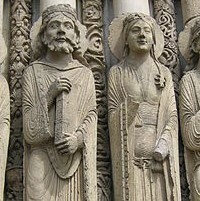 The first of these impulses can be seen in the sculpture on the west front of Chartres. The figures, with their stylized gestures and minutely pleated garments, are barely "real", and their forms are closely aligned with the architectural composition. Similar examples can be seen at Angers, Le Mans, Bourges, and Senlis cathedrals. The second creative impulse derived (1181-1210) from the school of Mosan art, in the metalwork of the goldsmith Nicholas of Verdun (and his older contemporary Godefroid de Claire), marked by graceful, curving figures and soft Greek-like ridged-and-troughed drapery (Muldenstil). A restrained version of this style decorated the main portals of the transepts of Chartres (c.1200-10), and can also be seen in Reims cathedral. A third impulse towards realism in Gothic sculpture, based on 10th century Byzantine prototypes, seems to have originated at Notre-Dame Cathedral Paris (c.1200). Instead of swirling drapery and curved figures, this style is characterized by figures with a square, upright appearance, who are quite restrained in their gestures. A good example of this style is the west front of Amiens cathedral (c.1220-30). A fourth style of realism originated at Reims with a craftsman named after his most famous figure, the Joseph Master. Ignoring both the gestural restraint of Amiens and the drapery of the Muldenstil, he produced (c.1240) figures with characteristics that endured for the next 150 years: namely, dainty poses and faces and thick drapery hanging in long V-shaped folds that envelop the figure. Gothic cathedral sculpture had a wide-ranging influence on Late Gothic painters and illuminators including the great Provencal artist Enguerrand de Charenton (Quarton) (c.1410-1466), creator of The Avignon Pieta (1454-6, Louvre, Paris). In Germany, the story is quite similar, except that German Gothic sculpture tends to be more emotional - see Strasbourg and Magdeburg cathedrals. A dramatic example of this emotiveness is found in the west choir (c.1250) of Naumburg cathedral. 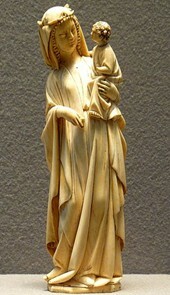 See also German Gothic Art (c.1200-1450). In general, this period saw a decline in architectural sculpture. Due to the focus placed on geometric patterning by Rayonnant Gothic architecture, this is not surprising. A few portals, like those on the west front of Bourges cathedral, were completed, but they have a limited interest. In contrast, the type of sculpture that was expanding with great rapidity was the more private one, exemplified by tombs and other funerary monuments. They included the tomb chest, typically decorated with small figures in niches - figures known as weepers, since they usually represented members of the family who were in mourning. Later, in the early 14th century, appeared representations of heavily cloaked professional mourners. This sculptural trend was initiated by Louis IX in his monuments to his ancestors and next of kin, mostly located in Saint-Denis (1260-70), though severely damaged during the French Revolution. Earlier precedents may be found, Louis IX's efforts did much to popularize the idea of the dynastic mausoleum, and numerous other important people followed suit. In England, as in France, most of the virtuosity in carving was ploughed into private tombs and monuments. The best surviving Gothic mausoleum is Westminster Abbey, where monuments carved in a variety of mediums (notably purbeck, bronze, alabaster, and freestone) are further enhanced by the floors and tombs executed by Italian mosaic workers employed by Henry III. The tomb of Edward II (c. 1330-35), in Exeter Cathedral, notable for its elaborate medieval canopy, is another fine example of English Gothic. German High Gothic sculpture is exemplified by the elegant draped figures around the choir of Cologne cathedral (consecrated in 1322), and by the impressive figures on the west front of Strasbourg cathedral (carved after 1277), which appear to be strongly influenced by the Joseph Master of Reims. As usual German sculpture tends to be far more expressive than similar French work. In Italy, the most important 13th-century sculptors included Nicola Pisano (1206-78) and his son Giovanni Pisano (1250-1314). Both worked mostly in Tuscany, and both executed pulpits that rank as their major completed works: Nicola being noted for sculpture in the Pisa Baptistery (1259-60) and Siena cathedral (1265-68), while Giovanni's pulpit in S. Andrea Pistoia (commpleted 1301), while technically less refined, is emotionally much more dramatic. In Milan, a shrine for the body of St. Peter Martyr was carved by Giovanni di Balduccio (c.1290-1349) in a style derived from the Pisano studio. More famous followers of Pisano include Arnolfo di Cambio (12401300/10), and Tino di Camaino, who worked at the Neapolitan court (c.1323-37). Arnolfo di Cambio's sculpture is solid and impassive. He excelled at formal compositions, such as the funerary chapel and the tomb of Pope Boniface VIII. Also he was the first architect of Florence cathedral (founded 1296). Tino di Camaino achieved fame as a tomb sculptor, and the largest collection of his work is in Naples. For more, see: Florence Cathedral, Brunelleschi and the Renaissance (1420-36). Another noted Italian Gothic sculptor was Andrea Pisano (1295-1348) (aka Andrea da Pontedera). His most famous sculptures were executed in Florence, the most important of which were his three bronze doors for the baptistery of the Cathedral of Florence (completed in 1336). He was highly influenced by the sculpture of Giovanni Pisano, as well as the painting of the Proto-Renaissance artist Giotto, which caused Andrea to make his figures rather stocky and solid. Despite the establishment of Romanesque painting on church walls and in gospel manuscripts, Europe was still not ready for painting as a major public art form. Tapestry art was still popular (and warmer) as a decorative wall covering, while most Gothic cathedrals, with their lack of wall-space, had less need than Romanesque churches for wall paintings. Instead, for colour effects, Gothic architects relied on stained-glass windows, which had now become very much larger than in the Romanesque period. In other painting genres the new style had a significant impact: thus, altarpiece art and illuminated manuscripts were all revitalized by the Gothic idiom. NOTE: For other important historical stylistic trends like Gothic, see Art Movements, Periods, Schools (from about 100 BCE). Early Gothic painting moved away from Byzantine art towards greater naturalism, taking the form of a softer, more realistic style, whose general characteristics endured until the middle of the 13th century. In France, the idiom is especially noticeable in a series of magnificent Bibles Moralisees - biblical manuscripts containing excerpts from the Bible accompanied by moral interpretations and illustrations arranged like stained glass windows - completed for the French royal court c.1230-40. In England the style can be seen in numerous manuscripts; for instance, the Amesbury Psalter (c. 1240; All Souls College, Oxford). In Germany Gothic artists avoided this graceful style, preferring a twisted, angular style called the Zackenstil. For instance, in the Soest Altar (1230-40, Gemaldegalerie SMPK, Berlin), the drapery is depicted in abrupt angular forms and often falls to a sharp point resembling an icicle. Gothic Illuminated Manuscripts were also influential on the development of panel painting and murals in northern Europe. To appreciate Gothic book illustration one must study the illuminated manuscripts that poured out from the scriptoria of the various monasteries from the beginning of the thirteenth century: Books of Hours, Missals, Apocalypses, Psalters, and Bibles. See, for instance, the Belleville Breviary (1326) and the Hours of Jeanne d'Evreux (1328) by Jean Pucelle (1290-1334). In these masterpieces the Gothic artist, no longer a mere contributor to the architectural ensemble, can unleash his fancy and indulge all his whims. The figures are sometimes elongated to the verge of caricature, like fashion drawings of today (see the second part of the Arundel Psalter in the British Museum). Grotesque creatures, as well as humorous or macabre touches abound. As the type develops it becomes more restless. The eye is not given a moment's peace. Intricate decorative backgrounds, borders of ivy leaves made even more spiky than nature had designed them, later on, landscape backgrounds (about the middle of the fifteenth century), with clumps of elaborate flowers in the foreground, scenes from contemporary life, sports and pastimes, feasting, travelling, cooking (the Luttrell Psalter of 1340 in the British Museum is crowded with such miniatures) can be found everywhere. One would think that in the fourteenth century life in north-west Europe was one vast confusion of gay delightful detail, a nursery packed with living toys. See also: History of Illuminated Manuscripts. High Gothic painting was greatly influenced by contemporary sculpture. This first became clear in Paris, where Louis IX was a leading patron. In an evangelary (a manuscript containing the four Gospels) at Louis IX's palace chapel of Sainte Chapelle (1241-48), one can see the early Gothic style superseded quite abruptly by a style of drapery incorporating the large, angular folds of the Joseph Master (Bibliotheque Nationale). Simultaneously there was a growing focus on detail, almost as an end in itself. Thus for example faces in particular became exercises in virtuoso penmanship. If certain figurative details like faces and hands continued to be depicted chiefly by means of line, drapery and other shapes tended to be modeled in terms of light and shade. This "discovery of light," began around 1270-80, but is particularly associated with the celebrated Parisian illuminator known as Master Honore, who was active about 1288-1300. It is also possible that it was stimulated by developments in Italian painting. The French style was introduced rapidly into England. Although Henry III was no book worm, a number of manuscripts produced for his family contain illustrations in the same dainty and minute style of Louis IX's artists. Likewise some large-scale paintings, notably the "Westminster Retable," survive in Westminster Abbey. Later changes in English painting, exemplified in works such as the Queen Mary Psalter (c.1330, British Museum), included ever more lavish border decorations. See also: Making of Illuminated Manuscripts. For details of 14th/15th century International Gothic illuminations, see: Jean Pucelle (1290-1334), the Limbourg Brothers (d.1416: see their Tres Riches Heures du Duc de Berry) and Jean Fouquet (1420-81: see his extraordinary Melun Diptych). During the 13th century both Rome and Tuscany had flourishing pictorial traditions, and both were heavily influenced by the medieval art produced in the Byzantine Empire. Sadly, since a good deal of the Roman work was later destroyed, evidence for what was happening in the capital must be sought outside the city - notably Assisi, where the upper church of St. Francis was decorated by Rome-trained fresco painters between 1280 and 1300, notably Cimabue (Cenni di Peppi) (1240-1302). As in the case of all Gothic decorative art, stylistic changes in Italy were in the direction of greater realism. By the end of the 13th century, Italian painters were beginning to use light to model their figures. They also made sudden advances in the manipulation of linear perspective to optimize spatial design in their painting. More than this, the best artists developed a keen ability to create figures that really seemed to be communicating with each other, by gesture or expression. A good example of this is the work of the Isaac Master in the upper church at Assisi. Unlike Northern Europe, Italy retained a strong tradition of large-scale murals, typically executed using the "fresco painting" technique" - a method involving pigment applied to, and absorbed by fresh lime plaster. Subjects of fresco painting included biblical or hagiographic narratives, and its greatest Gothic exponent was the painter Giotto di Bondone (1267-1337), whose classic work was the Scrovegni Chapel frescoes at Padua: see, for instance, the famous Betrayal of Christ (Kiss of Judas) (1305) and Lamentation of Christ (1305). However, despite the greatly increased realism of Giotto's work, he could not escape the pull of his Byzantine predecessors whose influence is clearly visible throughout the composition. In Tuscany the development of the Gothic style is best illustrated by Duccio di Buoninsegna (c.1255-1319), the most famous painter of the Sienese School of proto-Renaissance art, and creator of the Maesta Altarpiece (1308-11), formerly the high altarpiece of Siena Cathedral, and the Stroganoff Madonna (1300). The latter was one of the great Gothic panel paintings executed using tempera on wood. However, Duccio's skill in creating realistic space was much weaker than Giotto's and his work lacks the same dramatic impact. Of subsequent Florentine and Sienese painters, Simone Martini (1285-1344), who worked at the papal court in Avignon, is probably the most famous. See, for example, his Annunciation Triptych (1333) for Siena Cathedral. Other important artists included the brothers Pietro and Ambrogio Lorenzetti. See the latter's Allegory of Good and Bad Government (1338-9, Palazzo Pubblico, Siena. By about 1350, Italian painters had achieved a unique position in Europe. Their unique brand of Pre-Renaissance painting - with its advances in the art of narrative composition - set them apart from painters in the rest of Europe. Their improvements in the depiction of reality were not easily ignored, and northern painters made strenuous efforts to adapt Italian naturalism to northern purposes. With the advent of oil paint, the Flemish and Netherlandish schools would soon catch up and at times even surpass their southern counterparts. But that is another story.